The base of the system is the 3 mm thick steel plate (available in our shop as separate items in different dimensions), which is mounted (glued) onto a wall or any other vertical surface. A variety of magnetic shelves, hangers and holders are then fastened onto it. Hanger has magnets built into the back side, which fasten the element onto the steel plate. Therefore, you can change its position from one place on the back plate to the other, without using any kind of tools. Hanger is for those who prefer classical design. It is very handy in kitchens for hanging kitchen towels, gloves, spoons, cups, glasses, etc. With Steelline_magnet your creativity can roam free! Steel and wooden elements can be combined in different compositions, to serve your needs in kitchen, bathroom, office� Steelline_magnet line is easy to mount and maintain. The carrying capacity of each element is 2kg (4.4 lbs), with the option of increased capacity when made to order. Steel elements are powder coated in either black or white colour. 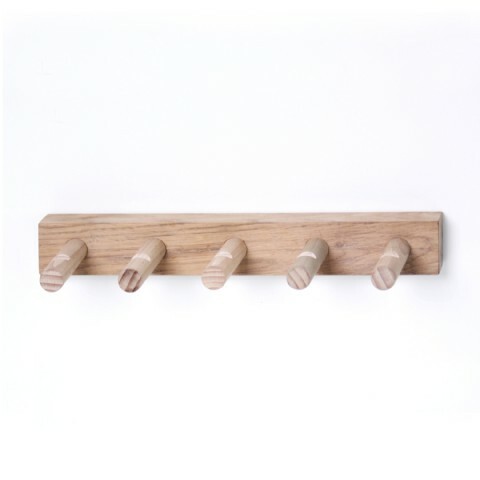 Wooden elements are made of solid oak wood and hand oiled. For bigger orders the colour of steel elements is optional, as is the colour of the oil for wooden elements.